UPDATE APRIL 2, 2019: Joana Mamombe, Zimbabwe’s youngest Member of Parliament at age 25, is facing treason charges for attempting to overthrow a constitutional elected government of President Emmerson Mnangagwa and if convicted she faces up to 20 years in prison. Mamombe, a former student leader during her university years was elected an opposition MP in Zimbabwe’s capital during last year’s general elections becoming the southern African country’s youngest legislator. ORIGINAL POST: In Zimbabwe, universities are sorely under-resourced; as a result, students are finding it difficult to complete their studies, and thousands are dropping out. One student, Joana Mamombe, is determined to change things. 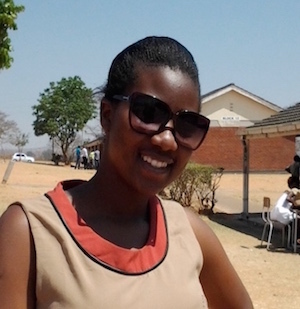 She is the Gender officer for the Zimbabwe National Students Union (ZINASU). In that role, she has shown immense courage—making her opinions known despite violent consequences. For example, she recently led a demonstration at Parliament calling for the government to eliminate exorbitant university fees. The response? She was beaten. But she wasn’t deterred: “As students, we are suffering as a result of the harsh economic environment prevailing in the country, and the government is not committed to assist us.” Mamombe asserted that she would keep on peacefully advocating for students’ rights peacefully, which is guaranteed in the part of Zimbabwe’s Constitution that promotes freedom of expression. Mamombe works with other groups, too. She is the National Coordinator for the Friedrich Ebert Stiftung Youth Alumni; her duties include organizing youth platforms that debate and discuss national issues. And she is an active member of the Movement for Democratic Change.